While they are not required at every visit, routine dental x-rays are a primary component of your preventative dental care plan. However, it is not uncommon for patients to question the necessity of these x-rays as well as their safety. A better understanding of modern dental imaging should put your mind at ease. Dental x-rays allow your dentist to see what is going on beneath the surface. This is important, as there are certain dental problems that don’t produce obvious outward signs and even more that start from the inside out. Therefore, by getting the recommended dental x-rays at your routine dental visit, we can gather key insight into your oral health and even help you avoid the cost of future treatments by catching issues early. X-rays can reveal tooth decay, gum disease, bone loss and permanent teeth that have not yet erupted. Without these images to prove that a dental problem exists, your dentist cannot legally treat you in many cases. 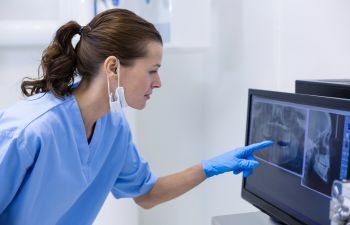 For the average patients, bitewing x-rays should be taken every year and a full series of x-rays (or panoramic x-rays) should be taken every 3 to 5 years. This can vary greatly depending on whether or not you have a history of cavities or other dental issues. Should I be concerned about safety and radiation exposure? According to the World Health Organization (WHO), if you are exposed to greater than 100,000 μSv per year, there is a minimal increased risk in getting cancer. That’s the same as getting about 3 sets of dental x-rays per day for the year! Even pregnant women are approved to get dental x-rays if they need it. The risk of not getting x-rays and missing an oral health issue is far greater than the miniscule risk of radiation exposure. Still have questions or concerns about dental x-rays? We’d love to answer them at Gilreath Dental Associates. We proudly use the latest and most advanced dental imaging available for the sake of better treatment and improved patient safety.